Need advice about a specific Hyundai Santa Fe Sport problem? Chart based on 115 repairs. 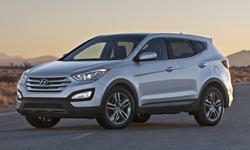 See TSBs and recalls for the 2013 Hyundai Santa Fe Sport. 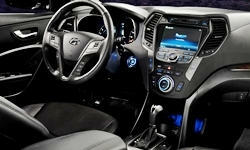 See repairs for all Hyundai Santa Fe Sport model years. 6000 mi Bottom of the passenger seat plastic surround was broke upon delivery. This is the 3rd attempt to fix the problem of plastic clips breaking. Service advisor says it is how people are getting in and out of the car. I think poor design/parts. 10000 mi Replaced trim. But I have had the same problem happen again with the front passenger seat trim and seat back handle and have to make another appointment to have them see it again. US $120 Radio stopped producing sound. Console worked and bac too but no sound. The battery died the day after the problem showed up. After googling it found many people with same car with the same issue. The solution was simply to press the reset button next to the cd drive! Went to the garage to double check the battery. US $8 rear left breaking light was burned out. US $100 Not known for recall but had a few light bulbs replaced. 8000 mi Intermittent problem with check fuel cap warning coming on. Passenger front door difficult to open from inside. 12000 mi Heated seat for right rear passenger not functional. Determined to be faulty heating pad. Parts ordered. Loaner car provided. Replaced Drivers Seat base with new parts. Had dealer recheck front end alignment to correct loose steering/vehicle wandering. Dealer reports no trouble found. 13000 mi Third time to dealer with same steering problem. This time dealer did alignment (2nd time) and "reset" the driver selectable steering function. I guess three's a charm as vehicle no longer "wanders' left and right at highway speeds. Rattle at highway speeds in left rear area of vehicle. Dealer found and repaired missing clip on mud deflector of left rear wheel. Keyless entry button on driver door not working as designed. Intermittently relocks door when it should unlock. 29000 mi Cracked trim part on driver's seat base. Nov 2012 Passenger seat belt had been originally installed with a twist in it. Seat belt was unbolted at the base and the twist was removed. 2000 mi Passenger seat had defect when delivered. Leather seat cover was replaced. Had to return a second time to readjust the replaced seat cover. 52640 mi Dash creak issue common on first-year models. Dealer removed dash, installed crash pad kit, and reinstalled dash. Issue is resolved. Tie-rod end had play in it. Passenger-side rear door sensor was not working. Vehicle did not detect when door was ajar. Dealer replaced under warranty. Performed updates as per TSBs Driver side windshield wiper was out of adjustment. Would hit the left edge of the windshield. Dealer adjusted. 53320 mi Whistling coming from driver side window. Dealer replaced weather stripping around driver door. Did not resolve issue. Later noticed gap window moulding rubber top corner of the door where it meets the vehicle. Will bring back. 26660 mi Rearview camera would only function intermittently. The screen would go blank randomly when reversing. They replaced the rearview camera. 11780 mi Door handle button on driver side didnt unlock door. 7440 mi Dash board started squeaking and the drivers seat loosened up Right taillight and mirror marker light would not go out. Traced back to a module that was installed with a hitch purchased before car was delivered to me. C $724 My 2013 Santa Fe was coming up to the end of the 5 year factory warranty and took it in for them to give it a peace of mind check from front to rear. Cleaned and reseal timing cover, replaced lower oil pan assembly, valve cover gasket and front crankshaft seal. Replaced Right rear shock absorber. US $35 One headlight burned out, replaced both. US $50 Fixed rocking drivers seat by replacing the seat rails(3 pieces). Had requested this shortly after buying the vehical new. Display screen would suddenly dim to night mode during the day. Unable to find the source of the problem. Lost ability to you Blue Link subscription service. Dealer initially didn't seem to know anything about it, had me contact Blue Link myself. They ran a diagnosis and determined the fault was at the vehicle. I returned the next week, because of this and some parts they had mis-ordered earlier, and had to remind them of it when I arrived to pick up the car. Turned out to be a loose connection at the Blue Link button on the mirror. 38000 mi Yuck! The lock is broke. They tried to fix it once. They couldn't get it right. Finally, they fixed it. I will not go to that dealer of her again. 3720 mi The dash was removed because the crash pad had slipped or was not glued properly and the result was creaking on/in the dash area. There was a squeaking in the left rear of the vehicle when going over a bump or up an incline. It sounded like styro foam rubbing against 2 pieces. 4340 mi Second attempt to repair creak in dash. Second attempt to repair suspension squeak. 4440 mi 3rd attempt to fix the dash problem. The dash was removed for the third time. Nothing was done about the rear end noise. I guess I will try to find that problem myself. 10640 mi The was a creaking noise when going over a bump or up an incline. The complete back end was taken apart and it was found that there was a bad weld. The problem was taken care of. 18380 mi New transmission due to leaking seal in the bell housing. 16400 mi The steering wheel controls for the volume was inadvertently controlling other functions. 51000 mi Smelled coolant and found puddle under vehicle. Dealer replaced radiator. Vehicle hesitates moderately on acceleration on first cold start of the day. Dealer cleaned throttle body. Campaign 935 performed by dealer Campaign 934 performed by dealer. Entire dash rattles on rough roads during cold weather. Has been happening for two years. Dealer marked issue as No Trouble Found. 56000 mi Rattles in dash never fixed. 30580 mi Tie rod was doing noise and the car wasn't driving in a straight line. C $150 Replaced pads becouse of some brake noise. Did not solve the problem. 2760 mi rear passenger seat heater ecu replaced under warranty. 9000 mi Dealer heard ticking sound in engine when I had a remote started installed. Changed oil, found metal shavings. They called Hyundai, then dropped the oil pan and found more shavings. took 2 weeks, but then they replaced the engine block. 40000 mi Lever to manually raise driver's seat broke. Waited two months to get part in. 93800 mi Struts don''t last long. At 90k they''re rough. US $50 Replaced all brake pads. 1240 mi HVAC console randomly shuts down completely 2-3 times a week. No fan, no display, knobs/buttons have no effect. Brought to dealer while problem occurring. Problem not fixed, new part to be installed next week. 1940 mi HVAC controls fixed. 8060 mi Replacement of the main control module for the HVAC system. This is the second time for this vehicle. Entire system would randomly shut down - no heat/cold/fan/display. Requires restart of the vehicle to reset. 57040 mi Both plastic trim pieces around the front passenger and driver seat broke yet again. The plastic or the clip design is too weak to handle people getting in or out of the vehicle and the stress snaps the press fit connectors. Passenger seat trim was replaced but the incorrect driver seat parts were ordered TWICE so that seat is still not repaired. Still waiting to hear back from the dealer. At least they are admitting the problem is with the design and even though the vehicle is out of warranty this is being fixed at no charge to us. 12000 mi Front of driver seat doesn't lift both corners equally, only the left corner. 23000 mi Clear coat on headlights began peeling. 41000 mi Center console was wobbly when it was I the open position. Driver seat rocked back ave forth slightly. 36000 mi rear camera went out for a week, but mysteriously came back on..Dealer checked it out..found nothing askew..
41000 mi A short in the driver-side door handle made the vehicle difficult to lock. The handle was replaced. 64200 mi The fog lamp bulbs literally fell apart. Apparently Hyundai has had a lot of problems with these bulbs. Even though my car's warranty had expired they only charged me for labor to replace them. It took about one hour to replace them. 13640 mi Dealer replaced the backup camera at no charge --- under warranty Remote entry works inconsistently. A/C temp setting switches from C to F without manual adjustment. 15500 mi Intermittent remote entry inoperable. Dealer replaced the remote entry pad. C $800 Tie rod end and ball joint repaired under warranty by Hyundai. 38440 mi Engine made a rattling noise and stopped and seized. Hyundai replaced the engine at no charge to the owner. 40920 mi Radio antenna rusted ground. Waiting for parts from Hyundai. 800 mi Transmission was making odd noise and was replaced. Still made odd noises after replacement. 3100 mi Car wanders and is hard to keep on track, regardless of steering mode. Car makes loud groaning noise when steering to far right or left at low speeds. Odometer doesn't report accurate gas mileage. Dealer did latest update and MPG seems closer to actual, but still not spot on. Side door molding needed repair. Replaced squeaking seat back. 11020 mi Door handles were replaced under recall procedure. 8680 mi Rough shifting between 1 st & 2nd gear on start up & when car parked for a few hrs in 0 deg C temps. Dealer confirms fault and replaces transmission with new. No problems after replacement. See our lemon odds and nada odds page to see vehicles with no repairs or vehicles with more than three repairs. To see how frequently 2013 Hyundai Santa Fe Sport problems occur, check out our car reliability stats.